de Porrata, R.; Broquetas, A.; Torres, F.
Phase noise is nowadays one of the most challenging limitations on radar systems sensitivity and its effects are specially important in remote sensing systems such as scatterometers and synthetic aperture radars. However, due to the complexity of such systems, these effects have not been deeply studied. In this paper a time-domain phase noise analysis is applied to a physical remote sensing radar system and, from the results obtained, a set of techniques for minimizing phase noise effects in this kind of systems is detailed. de Porrata, R., Broquetas, A., Torres, F. Modelado temporal de ruido de fase en osciladores y estudio de su impacto en sistemas de teledetección a frecuencias de microondas. A: Simposium Nacional de la Unión Científica de Radio. 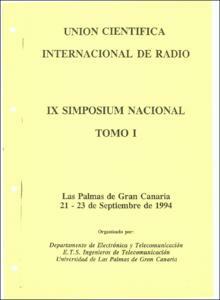 "Unión Científica Internacional de Radio: IX Symposium Nacional: Las Palmas de Gran Canaria, 21-23 de Septiembre de 1994: actas, tomo III". Las Palmas de Gran Canaria: 1994, p. 808-812.